Steve ‘MrTimCaum’ O’Dwyer earned himself another huge payday on Tuesday when he took down the partypoker LIVE MILLIONS UK £25,000 Super High Roller for £450,000. O’Dwyer topped a field of 51 entries to score another trophy for his case and move to more than $24 million in career live tournament earnings. O’Dwyer’s 2018 may be flying under the radar, as a lot of other players grab headlines, but he’s been no slouch on the felt this year with more than $4 million in live tournament earnings following this victory. It’s his eighth six-figure cash of the year and fourth of more than $500,000. 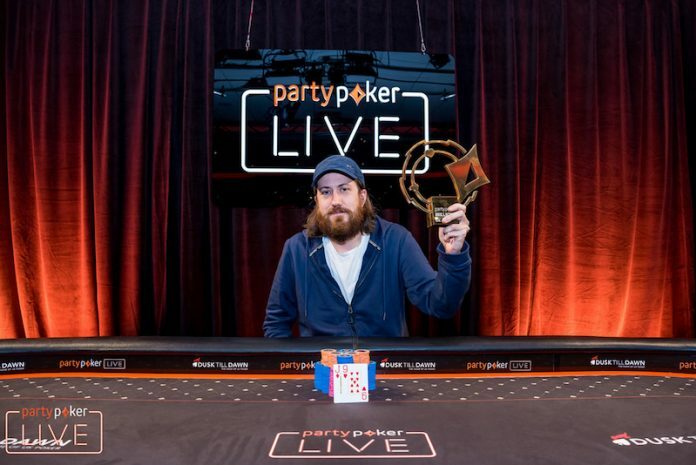 What’s more is that O’Dwyer’s victory in the partypoker LIVE MILLIONS UK £25,000 Super High Roller comes almost immediately after he wrapped up excellent performances in the 2018 PokerStars World Championship of Online Poker (WCOOP) and partypoker POWERFEST. In WCOOP, O’Dwyer won his first WCOOP title when he took down Event-57-H ($2,100 No Limit Hold’em Eight Max) for a $227,101 first-place prize. In the POWERFEST series, O’Dwyer took down Event #123 Super High Roller Championship Event: $25,500 No Limit Hold’em for $896,610. O’Dwyer defeated Fabrizio ‘SixthSenSe19’ Gonzalez in heads-up play, with Gonzalez taking home £236,750. Interestingly, the event’s third-place finisher, Orpen ‘orpenkk’ Kisacikoglu, placed second to O’Dwyer when he won the POWERFEST Super High Roller Championship Event. The top six places were set to finish in the money, and it was a notable face in 2013 World Series of Poker Main Event champion Ryan Riess eliminated on the bubble. Riess was short, with only four big blinds in his stack, and moved all in with the . He was called in two spots – Niall ‘firaldo87’ Farrell with the and Aymon Hata with the . The board ran out to bust Riess. In the money, O’Dwyer was fourth in chips but quickly scored a double up to take the chip lead. O’Dwyer doubled through Farrell, who then busted in sixth place. After that, O’Dwyer knocked out Haha in fifth. O’Dwyer also busted Christoph Vogelsang in fourth place when his came from behind against Vogelsang’s two kings thanks to an ace on the flop. O’Dwyer also came from behind when he spiked an ace with the against the pocket jacks for Kisacikoglu to knock Kisacikoglu out in third. O’Dwyer took a massive lead into heads-up play, with more than 45 million to Gonzalez’s 6.25 million. From there, he made quick work of Gonzalez to seal the deal. On the final hand, it was O’Dwyer coming from behind once again. He jammed with the against Gonzalez, who had just seven big blinds in his stack. Gonzalez picked up a dream hand with pocket aces, but the board gave O’Dwyer a full house and the victory. As the partypoker LIVE MILLIONS UK rolls on, stay tuned to PocketFives.com for more coverage. We’ll be recapping the £5,300 Main Event and £10,300 High Roller later this week.